Exactly 100 years ago: at 11 a.m. Paris time on 11 November 1918, the Armistice of Compiègne came into force, and the Great War came to an end. Though there had been no major naval battles since Jutland, the Royal Navy played a vital role in hastening the end of the war by defeating the German submarine campaign and maintaining an economic blockade. A key moment leading to the armistice was the Kiel mutiny – when sailors of the German High Seas fleet refused to sortie for another battle with the Royal Navy. We get to read our own particular view of the armistice, and the surrender and internment of the German Navy that followed, in the words of our own logbooks. 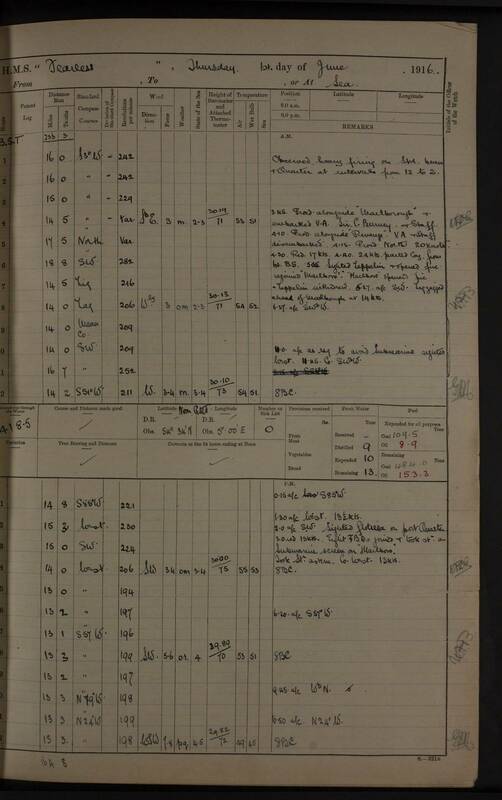 The logbook editing team has been working extra hard over the last few months to make sure that there is an edited version of every one of the oldWeather logbooks from the WW1 period available on naval-history.net. You can read the characteristically terse accounts of the end of the war from a whole list of ships from HMS Almazora (‘1.5am: Signal re “Armistice” received.’) to HMS Virago (‘11.30am: Party left for thanksgiving service on board HMS Tamar’). This November 11th we not only remember those who died in the war, we remember Gordon Smith, who did so much to lead and inspire the historical work done with our logbooks. It was Gordon’s fond wish to have the WW1 logs edited by the centenary of the armistice, so we also have something to celebrate: Congratulations to all those who have worked on transcribing and editing the logs to complete this. Two reconstructions of the ‘Sitka Hurricane’. 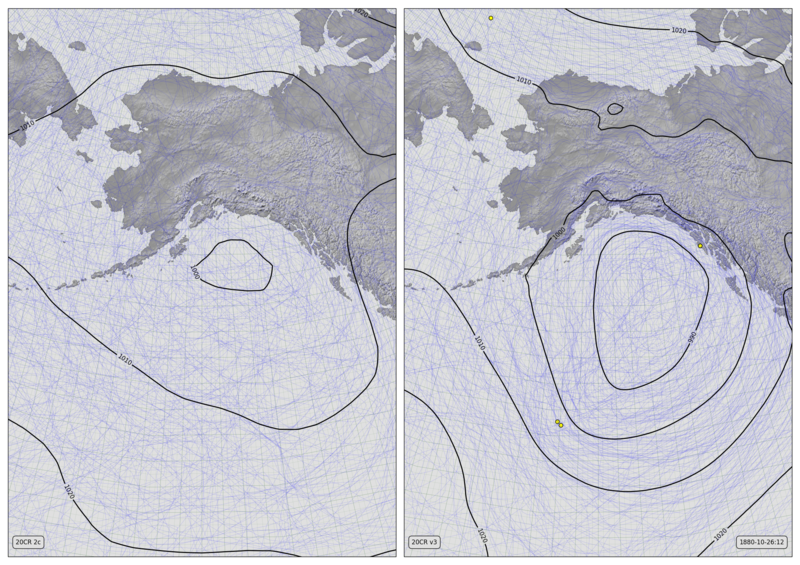 Pressure contours before (left) and after (right) adding oldWeather-Arctic observations from USC&GS Yukon. (Details). Sitka is in the Alaska panhandle, at 57 degrees North. So the storm that hit them on October 26th, 1880 can’t possibly have been an actual hurricane. But it was a very severe extratropical cyclone – probably stronger than any storm that has hit the Sitka region since. That is, because there are no pressure observations from the north-east Pacific in our databases for late 1880, the reanalysis uncertainty is so large we can’t say anything much about it. But that was pre-oldWeather Arctic – since then we’ve put many new observations from oldweather into a major database update, and the Twentieth Century Reanalysis (20CR) team have been working night and day building a new version of their reanalysis. The resulting improvement is large – the image above shows a before-and-after reconstruction: The key is those black concentric circles – a characteristic marker of a storm in a weather map, and of course the yellow dots – those mark our new observations. The hero here is USC&GS Yukon, providing those vital observations in the north Pacific. (You can just about see the the Jeannette up there in the Arctic Ocean also, but she’s too far away to have much effect on this storm). Two reconstructions of the ‘Sitka Hurricane’. 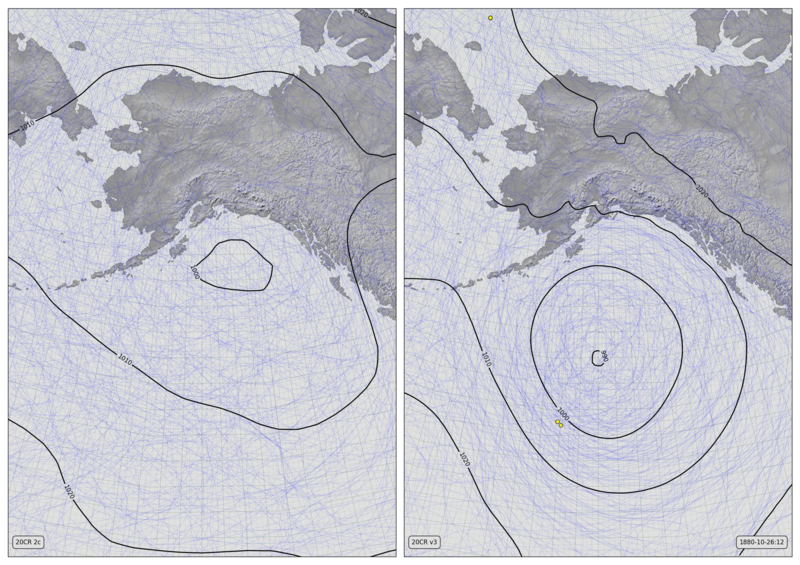 Pressure contours from 20CR2c (left) and 20CRv3 (right) adding oldWeather-Arctic observations from USC&GS Yukon and USS Jamestown. (Details). Adding the Jamestown strengthens and improves the storm reconstruction still further (particularly apparent in the video diagnostic). So thanks to everyone who has worked on the Yukon, the Jamestown, and 20CRv3 – between us, we’ve created a hurricane: An iconic storm which was missing in the last reconstruction is present in the new one. The uncertainty in the reconstruction is still large, but future researchers now have something concrete to work on. Original oW1 observations (red dots) and as revised using the edited ship histories (smaller yellow dots). Some new observations have been added (ships for which we now have good positions), a few errors in the original observation set have been removed, and much valuable new detail has been added. 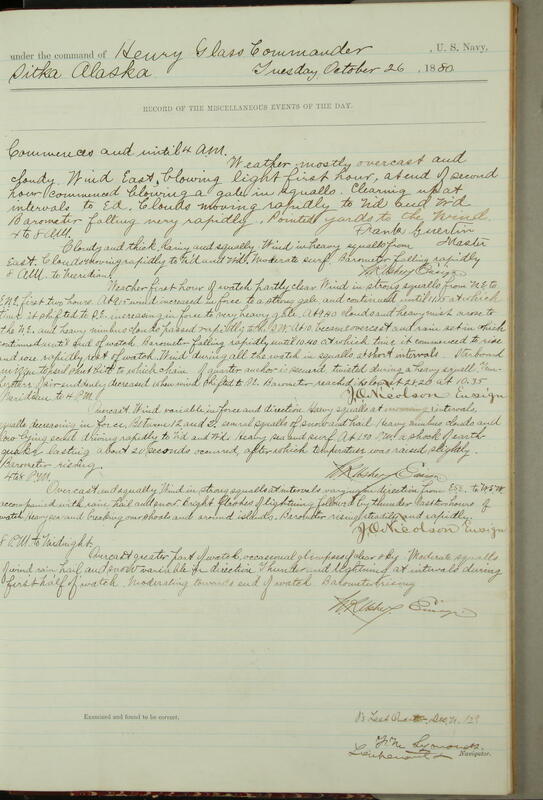 We finished transcribing the original RN WW1 oldWeather logbooks some time ago. And as soon as we could, we produced a set of climate data from those transcriptions: 1.6 million new weather observations. Those data have now been included in standard climate databases, and produced a notable improvement in major research products. However, we said at the time that those were preliminary data. They were useful as they were, but we hoped to improve them further in the future. In particular we struggled to get good position information from every logbook page: Generally, when they reported their latitude and longitude (’32 27 03 N’, ’24 78 08 W’) we could locate them successfully (though there are difficulties), but often the logs give their location as the name of a port or place, and tracking that down can be hard. When we made the preliminary set of climate data we did all the data processing (to turn the log transcriptions into climate records) in software. This is fast, but not powerful enough to deal correctly with the difficult positions. It got us what we most needed (as much data as possible, now) but a substantial fraction of our 1.6 million observations were left with positions that were missing, approximate, and, occasionally, just wrong. These issues did not damage climate products using the observations, but they did restrict them. Effectively, many of our observations were not good enough to use. What we really needed was a careful, expert examination of the record for each ship, teasing out the precise route of each ship from the limited, idiosyncratic, and occasionally just wrong, information in the log. This would require two things, a group of expert analysts, and time for them to work. One of the glories of oldWeather is the expertise and dedication of the project community, and the ship history editors, in particular, have been working through the log transcriptions, using their expertise to make edited histories, and maps, of their travels. They have not had enough quite time to finish the task – not every ship has yet been edited – but most are done, and once again we need the data now. So I have gone through the edited histories and used their position records to improve the weather data records. This has improved our weather records a lot (see the video above). Some ships with log details that defeated the software the first time around now have good positions and can be used for the first time. More have details improved and some errors fixed. A particularly noticeable improvement are the gunboats on rivers in China, which now show movement along the Yangtze in good detail. We still have 1.6 million records, but about 500,000 of them have received a big upgrade in their quality, and this will feed through to substantial improvements in the climate products we derive from them. Gordon Smith, who guided the historical side of oldWeather from the beginning, died on 16 December 2016 after a long illness: he was 75. Gordon joined oldWeather in April 2010. He was brave enough to team up with a group of scientists planning a citizen science project rescuing historical climate observations. His job was to broaden the scope of the project – to teach us to value and use the ship logbooks we were reading as historical records, not just sources of pressure and temperature observations. Gordon was a serious scholar, the author of two books on naval history, but he also had the vision to see that writing books was no longer the best way to communicate his subject, and the courage to try something new. He founded a website (naval-history.net) and, with a group of collaborators, built it into a valuable resource for both professional and amateur historians. The thousands of volunteers contributing to oldWeather offered a flood of new material for naval-history.net, but that material needed to be checked, collated, and edited, to be useful to researchers. Gordon dealt with this by engaging unreservedly with the volunteers reading the logbooks; advising, encouraging, and teaching anyone interested. Some of the volunteers became sufficiently expert and enthusiastic to take on the necessary editing work, and this group of new naval historians is now playing a major role in the ongoing development of naval-history.net. The success of oldWeather as a history project has also helped our work in climate science. Expanding the project in this way has been vital in sustaining the public interest that has kept oldWeather going for six years; now 20,000 people have contributed, generating millions of additional historic weather observations for use by researchers. Gordon was able to do all this because he was not trying to write a book, or build his personal career as a historian. Instead he was willing to build naval-history.net as a public service, and to train and support a large number of amateur historians working with him. This long period of innovative and unselfish work has not only produced a valuable historical resource, but has also been of material assistance to climate science. oldWeather is both bigger and better for his contributions, and we’ll go on building on what he started. A spaghetti-contour plot of a storm in 1916 as reconstructed by the 20th Century reanalysis. On the left, without oldWeather observations, on the right with the oldWeather ships added. The yellow dots mark observations used in the reconstruction – the additional yellow dots in the right image are from Royal Navy ship logs transcribed by oldWeather. Next week sees an important event in the calendar of the observational climatology community: the ninth annual meeting of the Atmospheric Circulation Reconstructions over the Earth (ACRE) project, in Maynooth, Ireland. I’ll be there to talk about the new knowledge we are generating with oldWeather, and I thought I’d share a sneak preview here. The picture above is a pair of contour plots: on a map contour lines mark places with the same height and they are used to show the shape and size of hills. Here the lines mark places with the same atmospheric pressure, and they show the size and shape of a valley in the atmosphere – an atmospheric depression – a storm. The picture is messy because this is also a spaghetti plot – I have 56 different maps of the same storm (the individual ensemble members of the 20th century reanalysis) and I’ve drawn all 56 in the same image. In an ideal world we’d know exactly the size and shape of this storm, so all 56 maps would be exactly the same and the plot would show pin-sharp simple contours. We’re not there yet, but adding the oldWeather observations to the reconstruction has made things a lot better – our map of this storm is much more precise than it was before. 100 years ago today – 31st May 1916, saw the start of a major fleet action between the British and German navies: The battle of Jutland. This is right in the middle of the period covered by the original oldWeather project, so you’d think we had all the logbooks and observations, at least from the British half of the battle, but alas, it’s not so. The Grand Fleet sounds impressive, and with as many as 40 major warships surely was impressive, but it didn’t travel much: The doctrine of ‘Fleet in being’ means that all those battleships stayed in port as a threatening influence rather than travelling to distant locations, and that puts them right at the bottom of our priority list for transcription, and we’ve never looked at them. Plenty of our ships are contributing to that weather reconstruction – in port on the West coast, on patrol or convoy duty in the North Atlantic, and they are doing a good job describing the dominant weather feature – the low pressure moving into the Norwegian Sea. But the North Sea around Jutland is pretty bare of observations – two major fleets, and we have almost nothing from either of them. The reason we don’t have them is that we don’t need them – the European weather stations give us a pretty good picture of the weather anyway, and the ships were only out of port for two days, so they wouldn’t be a huge asset to science; but it’s still a pity from the historical perspective, we’ll keep an eye out for a future opportunity, both in the UK and in Germany. The weather did, apparently, play a part in the battle – strong winds grounded the Zeppelin fleet that would otherwise have been scouting and bombing on 31st May – and it was one of those Zeppelins that engaged (on June 1st) the only member of our fleet to have participated in the action at all: HMS Fearless was not big enough to mix it with the battleships and battlecruisers; but she was there, and you can read the story we rescued from her logs at naval-history.net (and see the observations she made in the video above). The battle had no winners – 9,823 men died, and 25 ships were sunk, including one (HMS Invincible) who’s story helped inspire the start of oldWeather.